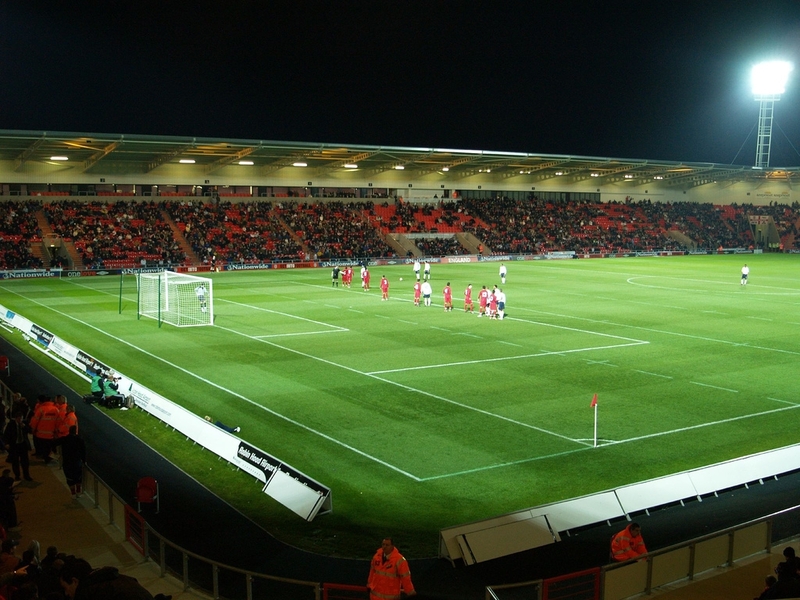 INFORMATION about Doncaster Rovers' Keepmoat Stadium. Including details on the history of Doncaster's stadium, including how to get the the Keepmoat using the railway services, bus services and of course by car for visiting away supporters, who must be prepared to leave with no points. Doncaster Rovers moved to the Keepmoat Stadium on the 1st January 2007, following 84 successful years at the infamous Belle Vue Stadium. The Keepmoat cost around £22Million to build, and is also housing Doncaster Lakers' Rugby League outfit and Doncaster Belles Ladies F.C. From the A1(M) join M18 Eastbound at Junction 35 (signposted Hull) or from the M1 and join the M18 Eastbound at Junction 32. There are just 1,000 car parking spaces at the stadium, which will mean that for the bigger games, parking will be at a premium. There are 60 parking spaces reserved for disabled fans, which must be booked prior to matchday. The stadium management are also giving preference for parking to those cars carrying more than one passenger, but apparently this won't be enforced. The cost of parking at the stadium is £5. A number of firms on the nearby industrial park, offer matchday parking at around £3-£4 per vehicle. If you happen to arrive a couple of hours before kick off then there is also some free street parking to be had in this area. There is no coach parking available at the stadium. Visiting supporters' coaches drop fans off at the stadium and park off site. On coming out of the railway station, walk to the dual carriageway across the car parking area and turn to face to your right (i.e. away from the road tunnel under the Frenchgate shopping centre). You are now looking down a more or less straight line to the stadium. Provided you then use the appropriate places to cross roads as necessary you just follow the line of the dual carriageway to the roundabout adjacent to Vardy's Renault dealership. Then turn left into Middle Bank and follow the road round to the stadium. The bus service has been improved for matchdays. From around two hours before kick off there is a dedicated shuttle service from the Doncaster Interchange bus station, which is adjacent the train station and under the Frenchgate Shopping Centre. This is Route 75X and runs every 10 minutes direct to the Stadium. It leaves Stand C6 and the journey takes less than 10 minutes depending on traffic. The bus stops in a lay-by at the Ground close to the Ticket Office and after the match leaves for Doncaster Interchange from the same place. Cost is presently £1.10 each way.